There are these dishes you just forget about. They used to have their golden years, when they were regularly on the menu, you had their ingredients in the cupboard all the time, and everyone really enjoyed them (especially you) – and then they were all forgotten. Perhaps you had it too much; or you met new people who thought it nothing special, or the ingredients disappeared from your regular shopping trips – or you just moved on to some nicer, newer dishes. Or you simply forgot. 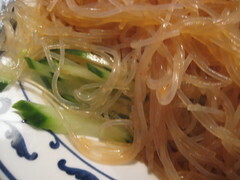 This is one of these dishes, lengban fensi Chinese ‘cold mixed glass noodles’. I had it at least once a month in the 90s, because it is so easy, and I wrote about it in my cookbook-to-be (a simple computer handout, which I gave to some friends), and there I discovered it again last week. It is great as a side dish for larger dinner parties, because it is a cold salad and can be made beforehand. Plus it is really yummy. Make a nice tasting sauce with about 3 tablespoons of soy sauce, 1 to 2 tablespoons of sesame oil, and at least 3 to 4 tablespoons of Szechuan pepper-oil. This very flavorsome, peppery, addictive oil can be found in Asian supermarkets. The oil is made from Sichuan pepper, the true Sichuan spice which gives its special kick to almost any Sichuan dish. Use a lot of it- your salad will definitely improve! Add some Shaoxing rice wine or Japanese mirin for extra flavor, taste for salt. Mix the noodles with the mixture until all flavors are absorbed by the noodles. If you like spicy you can add some of your favorite chili oil or chili paste as well. Cut half the cucumber into julienne strips and put on a plate. Then put the noodles over (I had too many noodles for the plate). Let sit and enjoy with Peking duck, jiaozi or any other Chinese dinner stuff. Even my daughter who says she doesn’t like spicy added heaps of it on her plate and finished it all. The noodle salad is back to stay!